Happy Diwali/Deepavali to all my readers and friends, may this festival lights bring all the brightness in your life. Usually for Deepavali/Diwali I make both sweets and savories, with sweet dishes over out numbering the savories. So for this Diwali that is on November 11th I planned to make two savory dishes and some sweet dishes. 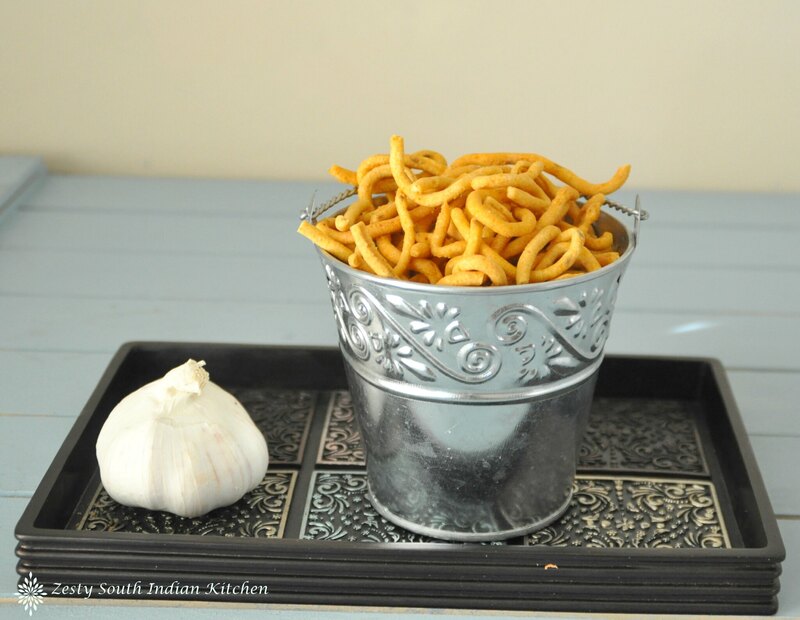 One is this Sattur kara sev/ Garlic flavored fired noodles. The locals fondly call this Sattur sevu. This is an excellent tea /coffee time snack, if you like spicy treats then you are going to munch this one for sure. So while searching for the recipe in YouTube, I find this one Sattur Poondu kara sev from a small shop in Vidhuranagar in a food travel show Sutralam Suvaikalam by my facebook friend Rakesh Ragunathan. I like his show because he is only food travel show anchor who doesn’t bother the person who is making the recipe. Otherwise most of Indian show anchors want to take control and they interfere too much by trying to repeat what the chef is saying. Then there is another group who tries cracks the jokes which fall flat most of the time. This Sattur Poondu Karasev is very famous, and a 4th generation in the family now runs the shop. They don’t have any machinery and everything done by hand. In most of other recipes of kara sev they use little oil while making the dough. However in this recipe they are not using any oil while mixing the dough, only cooking with it. I like the process as they mix everything except flours at first in the water then add flour. Since the guy who mixed the dough never gave exact measurement I used my own proportion. I used his particular technique of mixing the dough. This Sattur karasev is the closest cousin of Bhujiya a thicker version. The cook is making the sev by spreading the dough through perforated plate which falls as noodles in hot oil and gets fried. Since I don’t have that perforated plate I tried to use slotted spoon, but was not successful in the attempt, so used my own kara sev mold to make it. It turned out to be successful. In the Hindu article it is mentioned that this store uses a combo coconut and refined oil to fry the karasev. I didn’t use it as I like to fry with peanut oil as it is easy to maintain the temperature throughout. I knew when I saw the video it is going to be delicious, and yes it turned out like that. If a person makes a living by selling something, then that recipe is gem because no-one comes back to him if his product is not good. He is not doing any TV advertisement, high profile pictures and banners. Only because of word-mouth publicity he is able to sell the product. That kind of recipe attracts me the most than any high flying TV chefs or one with breathtaking photos. 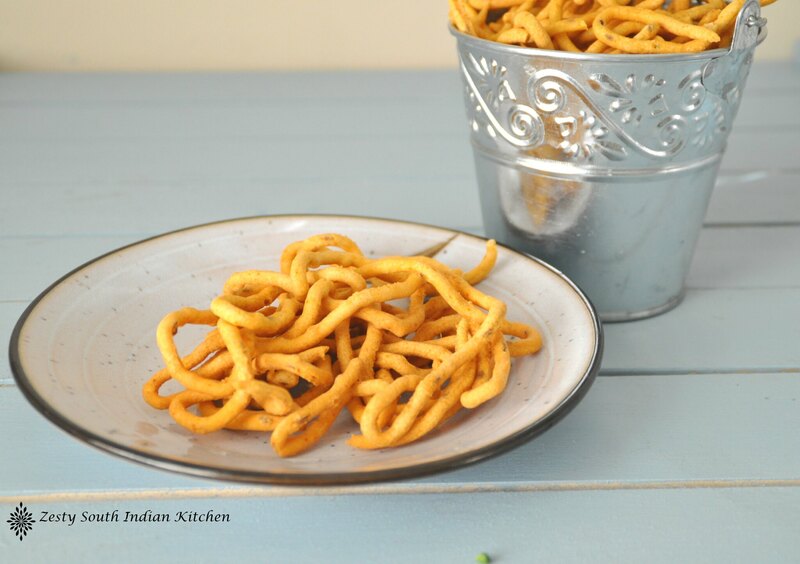 Here comes the utterly delicious, simple easy recipe of tea time snack. Once you make it is going to stick around in your kitchen for long time. 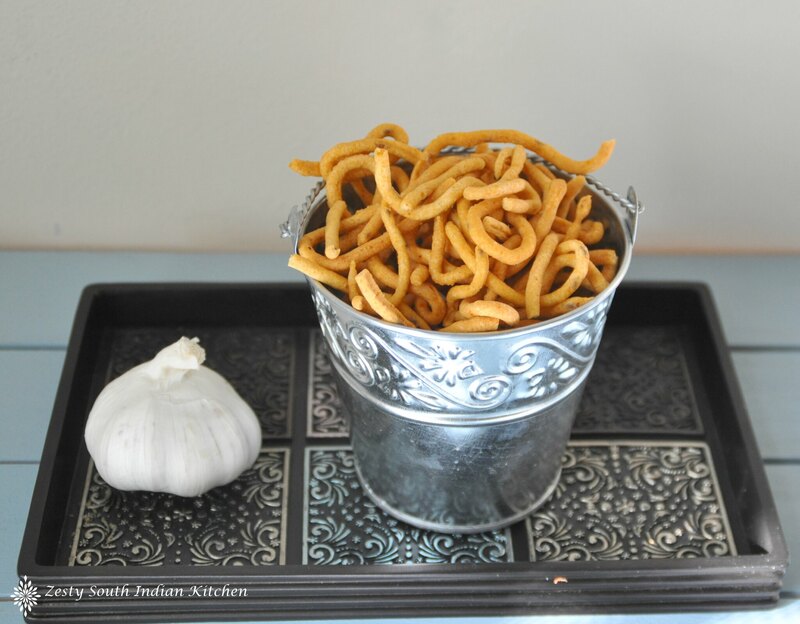 Delicious crispy savory snack Sattur Sev goes well with coffee or tea. To this add besan/chick pea flour and rice flour to form smooth dough. Heat oil in a thick bottomed pan, when it reaches 375F or when you add a little piece of dough into the oil it will comes up to surface with a hissing sound, it is ready to fry. Flip in between few times and fry until it turns golden brown color. Drain it in a kitchen tissue for removing extra oil. Continue frying the rest of dough until you finished entire dough. Store it in a air tight container for week if you have anything left. julie recently posted…Ghee Mysore Pak (Step by Step Pics) & Diwali Wishes !!! I could eat that whole can of fried noodles!!! What a treat Swathi! Can’t wait to try these. Delicious Kara Sev, the step wise pics makes it easy and self explanatory. Happy Diwali Wishes to you and Family Swathi ! I love garlic! This looks yummi! They do look super tasty and crispy, Swathi! Pinning and tweeing! Crispy and tasty snacks..I can smell the garlic flavours..
Karasev looks delicious. Next time I am going to try this one. Looks crunchy and yummy. 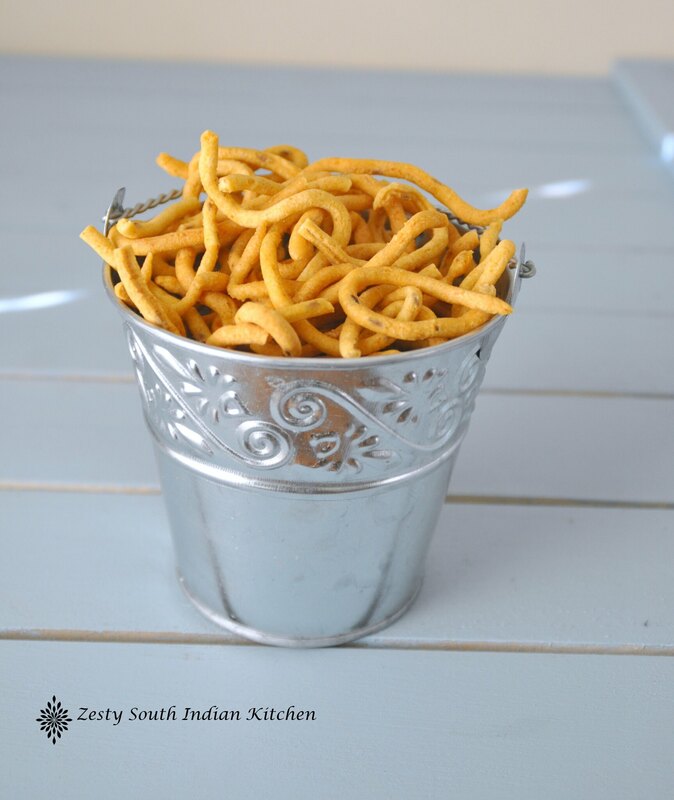 Crispy, delicious kara sev… i would like some!